^ Blue, Jennifer. Planet and Satellite Names and Discoverers. USGS. 9 November 2009. ^ 2.0 2.1 2.2 2.3 2.4 Overview of Europa Facts. NASA. [2007年12月27日]. （原始内容存档于2014年3月26日）. ^ JPL HORIZONS solar system data and ephemeris computation service. Solar System Dynamics. NASA, Jet Propulsion Laboratory. [2007年8月10日]. ^ 4.0 4.1 4.2 4.3 4.4 Yeomans, Donald K. Planetary Satellite Physical Parameters. JPL Solar System Dynamics. 13 July 2006 [2007年11月5日]. ^ Geissler, P. E.; Greenberg, R.; Hoppa, G.; Helfenstein, P.; McEwen, A.; Pappalardo, R.; Tufts, R.; Ockert-Bell, M.; Sullivan, R.; Greeley, R.; Belton, M. J. S.; Denk, T.; Clark, B. E.; Burns, J.; Veverka, J.; Hoppa, G.; Helfenstein, P.; McEwen, A.; Pappalardo, R.; Tufts, R.; Ockert-Bell, M.; Sullivan, R.; Greeley, R.; Belton, M. J. S.; Denk, T.; Clark, B. E.; Burns, J.; Veverka, J. Evidence for non-synchronous rotation of Europa. Nature. 1998, 391 (6665): 368–70. Bibcode:1998Natur.391..368G. PMID 9450751. doi:10.1038/34869. ^ Bills, Bruce G. Free and forced obliquities of the Galilean satellites of Jupiter. Icarus. 2005, 175 (1): 233–247. Bibcode:2005Icar..175..233B. doi:10.1016/j.icarus.2004.10.028. ^ McFadden, Lucy-Ann; Weissman, Paul; and Johnson, Torrence. The Encyclopedia of the Solar System. Elsevier. 2007: 432. ISBN 0-12-226805-9. ^ McGrath. Atmosphere of Europa. (编) Pappalardo, Robert T.; McKinnon, William B.; and Khurana, Krishan K. Europa. University of Arizona Press. 2009. ISBN 0-8165-2844-6. ^ Chang, Kenneth. Suddenly, It Seems, Water Is Everywhere in Solar System. New York Times. 12 March 2015 [13 March 2015]. ^ 14.0 14.1 Kivelson, M. G. et al, "Galileo Magnetometer Measurements: A Stronger Case for a Subsurface Ocean at Europa" Science 25 August 2000: Vol. 289. no. 5483, pp. 1340 - 1343. URL accessed 15 April 2006. ^ Billings S. E., Kattenhorn S. A. The great thickness debate: Ice shell thickness models for Europa and comparisons with estimates based on flexure at ridges. Icarus. 2005, 177 (2): 397–412. doi:10.1016/j.icarus.2005.03.013. ^ Hall, D. T. et al, "Detection of an oxygen atmosphere on Jupiter's moon Europa"（Abstract only）Nature 373, 677 - 679, 23 February 1995. URL accessed 15 April 2006. ^ "NASA 2006 Budget Presented: Hubble, Nuclear Initiative Suffer" 7 February 2005 Space.com article. URL accessed 15 April 2006. ^ Tony Reichhardt. 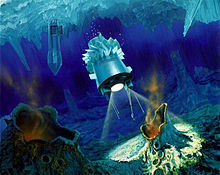 Designs on Europa unfurl. Nature. 2005, 437: 8. doi:10.1038/437008a. 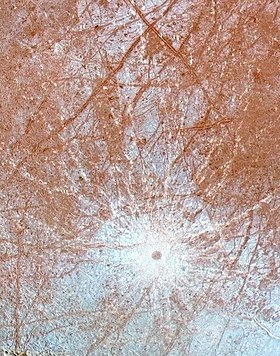 ^ McKay C. P. Planetary protection for a Europa surface sample return: The ice clipper mission. Advances in Space Research. 2002, 30 (6): 1601–1605. ^ Powell J., Powell J., Maise G., Paniagua, J. NEMO: A mission to search for and return to Earth possible life forms on Europa. Acta Astronautica. 2005, 57: 579–593. doi:10.1016/j.actaastro.2005.04.003. ^ P. Weiss, K.L. Yung, T.C. Ng, N. Komle, G. Kargl, E. Kaufmann. Study of a thermal drill head for the exploration of subsurface planetary ice layers. Planetary and Space Science. 2008, 56: 1280–1292. ^ " 科学家拟用破冰机器人深入外星冰封海洋" 页面存档备份，存于互联网档案馆 2008年08月30日xinhuanet.com. ^ Hsu, J. Dual Drill Designed for Europa’s Ice. Astrobiology Magazine. ^ Solar System Exploration: This is the 2006 Solar System Exploration Roadmap for NASA's Science Mission Directorate (PDF). Universities Space Research Association. September 2006 [2006-09-29]. Are our nearest living neighbours on one of Jupiter's Moons?